For example, bakeries, candy stores, and custom tailors are considered manufacturing because they create products out of components. On the other hand, book publishing, logging, and mining are not considered manufacturing because they don't change the good into a new product. Construction is in its own category and is not considered manufacturing. New home builders are construction companies that build single-family homes. New home construction and the commercial real estate construction industry are significant components of gross domestic product. 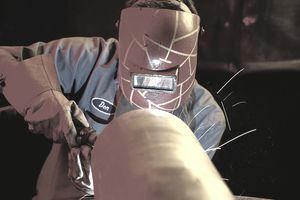 There are 12.75 million Americans in manufacturing jobs, the National Association of Manufacturers reported from the Bureau of Labor Statistics. In 2017, they earned $84,832 a year each. This includes pay and benefits. That's 27 percent more than the average worker, who earned $66,847 annually. U.S. manufacturing workers deserve this pay. They are the most productive in the world. That's due to increased use of computers and robotics. They also reduced the number of jobs by replacing workers. Yet, 89 percent of manufacturers are leaving jobs unfilled. They can't find qualified applicants, according to a 2018 Deloitte Institute report. The skills gap could leave 2.4 million vacant jobs between 2018 and 2028. That could cost the industry $2.5 trillion by 2028. Manufacturers also face 2.69 million jobs to be vacated by retirees. Another 1.96 million are opening up due to growth in the industry. The Deloitte report found that manufacturers need to fill 4.6 million jobs between 2018 and 2028. If you want details about any of the industries, go to the Manufacturing Index. It will tell you more about the sector, including trends and prices in the industry. You'll also find statistics about the workforce itself, including fatalities, injuries, and illnesses. The Bureau of Labor Statistics describes what these jobs are like, how much education or training is needed, and the salary level. It also will tell you what it's like to work in the occupation, how many there are, and whether it's a growing field. You can also find what particular skills are used, whether specific certification is required, and how to get the training needed. This guide can be found at Production Occupations. Manufacturing processes are changing, and so are the job skills that are needed. Manufacturers are always searching for more cost-effective ways of producing their goods. That's why, even though the number of jobs is projected to decline, the jobs that remain are likely to be higher paid. But they will require education and training to acquire the skills needed. That's for two reasons. First, the demand for manufactured products is growing from emerging markets like India and China. McKinsey & Company ​estimated that this could almost triple to $30 trillion by 2025. These countries would demand 70 percent of global manufactured goods. How will this demand change manufacturing jobs? Companies will have to offer products specific to the needs of these very diverse markets. As a result, customer service jobs will become more important to manufacturers. Nanotechnology is creating a new era of microelectronics. Lightweight steel, aluminum, and carbon fibers are making cars lighter and more fuel-efficient. Bio-engineering creates more customized pharmaceuticals. 3D printing creates prototypes by combining small particles rather than by casting or stamping. But this is being used more and more to manufacture specialized aerospace components and human organ replacements. Robots are becoming more sophisticated. Big data is being used to analyze customer trends and guide product development. Can You Imagine a World Without Banks? Is a Small Business Loan Right for You?